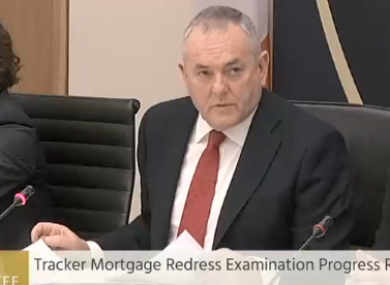 'Take a look in the mirror': Why didn't the Central Bank act earlier on the tracker mortgage scandal? The Central Bank’s governor Philip Lane confirmed 13,000 impacted customers are still waiting to get their money back. THE HEADS OF the Central Bank were criticised today for failing to step in sooner and take action in relation to the tracker mortgage scandal. Thousands of customers were overcharged by their lenders when they were either denied the right to a tracker mortgage at some point over the term of their loan, or charged the wrong rate of interest. In the worst cases, people lost their homes as a direct result of their bank’s failings. Appearing before the Oireachtas Finance Committee today, Central Bank governor Philip Lane and his senior team faced harsh words from some members as they questioned how this was allowed to happen under the regulator’s watch for so long. Chair of the committee John McGuinness told Lane that lenders had been “hoodwinking” the Central Bank. “I hope you have a big mirror down there that you will look into,” he said. The Fianna Dail TD did acknowledge that more recent remarks from Lane had been stronger and more critical of lenders. In his opening remarks to the committee, the governor had spoken of “unacceptable failings”, about how they had “hauled in lenders’ senior management” and about how they will continue to challenge the banks “robustly”. He also said all possible angles will be considered in current and future enforcement investigations, including potential individual culpability. McGuinness said he did not want Central Bank executives to “get into a comfort zone”. I will not judge you on your language, I will judge you on the action you are prepared to take on behalf of customers who have been robbed by the banks. He reminded the governor that he had told the committee the Central Bank was active on this issue in 2008. Prior to this current investigation, it had already challenged a number of lenders over their tracker mortgages, including an enforcement investigation into Springboard Mortgages – an offshoot of PTSB – which resulted in a €4.5 million fine. McGuinness said recent movement from the banks to work through this issue was merely “a smokescreen” until the issue goes away, and not a culture change. He also spoke of vulture funds who are rigorously pursuing Irish customers who are in mortgage arrears. While the Central Bank delves into the culture of the banking sector in Ireland, McGuinness said the “next generation of bankers are being educated by the vulture fund managers such as capita and others into how you deal with customers”. Lane confirmed to the committee that more than 13,000 customers are still waiting to get their money back and receive compensation. He said lenders have been “forced to pay €316 million in redress and compensation” so far and he expects everyone will be paid by June this year. “Lenders are counting the cost of this scandal. In addition to the redress and compensation we require them to pay, these institutions are bearing significant administrative costs to conduct the examination in line with our requirements,” he said. Fianna Fáil’s Michael McGrath took issue with the use of the word “forced” in relation to the money paid out, reminding Lane that this is “the borrowers’ own money”. Senator Gerry Horgan also pointed out to Lane that with the average rate of compensation at 15%, the bulk of the €316 million paid out was customers’ money that the bank never should have taken. He said a failure to pay money to Revenue, for example, would result in significant penalties and interest applied, more than 100% of the sum not paid in some cases. Lane told committee members that the average compensation rate may go up as the examination continues. He also referenced the enforcement investigatons, which are likely to result in fines for the banks. And, he said “the reputational damage has been severe”. The committee will be back later this afternoon with further questions for Lane and his team. Email “'Take a look in the mirror': Why didn't the Central Bank act earlier on the tracker mortgage scandal?”. Feedback on “'Take a look in the mirror': Why didn't the Central Bank act earlier on the tracker mortgage scandal?”.